Small Group: Tour is carried out for small groups 6 persons max! St. Petersburg, Russia is rightfully considered a pearl of the Baltic Cruises. Not diminishing other Baltic Cruises cities' virtues, St. Petersburg is something completely different. The majestic Russian Northern Capital has so much attractions, palaces, and cathedrals to see that arranging a good shore excursion is a must-do for every Baltic Cruise Passenger. During this VISA-FREE St. Petersburg Shore Excursion you will visit the major remarkable landmarks of St. Petersburg, Russia, get familiar with the Russian culture and lifestyle and learn many amazing facts about Russian history. Join our Shore Tours to St. Petersburg, Russia! 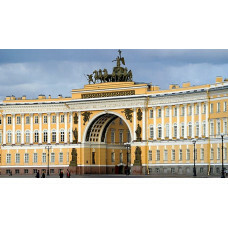 2-Day Discover St. Petersburg tour is guaranteed if there's minimum 2 people on the tour. We will unfortunately have to restrict babies (under 2 years old) and people with mobility restrictions participating in this Tour, as they may slow the group down. The order of visits and the time of the tour start depend on your ship's schedule and may be changed. If you have any dietary restrictions, please, inform us in advance.